Needs mechanical pump and PV electrical panel. 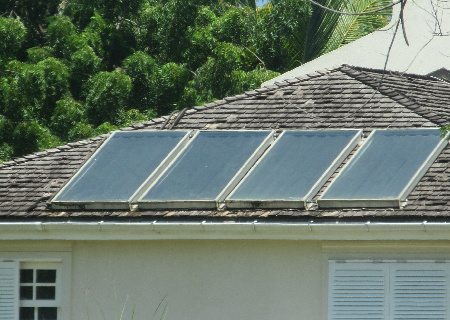 Photovoltaic panel requires direct sunlight to energize the pump. Will produce less hot water year round and may need boosting occasionally. Requires a collector area of 1sq.ft to 2 gallons. The “split” Solar Dynamics Hot Water System is designed to meet the aesthetic needs of customers who prefer to have the storage tank in a location other than the roof. The split system is also suited to those installations where the angle of the roof is very steep. The system features the collector being located on the roof, while the storage tank is located at a lower level. A pump (mechanical force) is required to move the water from the bottom of the storage tank to the collector/s on the roof. Solar Dynamics uses the most modern technology with a direct current pump, which is energized by a Photovoltaic Panel. This pump will circulate the water through the system, moving the coldest water to the collector for heating; and returning the heated water to the upper layers of the storage tank. 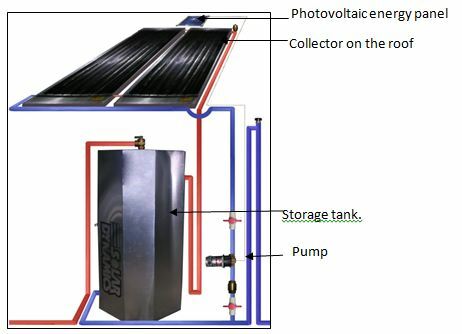 The use of a solar energy operated pump eliminates the need for the control and sensors of the old technology pumped system. The Solar Dynamics “split” system allows for vertical or horizontal placement of the storage tank. Vertical storage of heated water is the more efficient in heat retention, while horizontal placement, though not as efficient, is preferred for aesthetic appeal. “Split” or forced circulation systems are not as efficient in the absorption and transfer of heat as their convection or natural circulation counterparts, and additional collector area is provided to compensate for the difference. Where aesthetics are of major concern, the right-sized Solar Dynamics Split Hot Water System meets the specifications of performance with beauty.